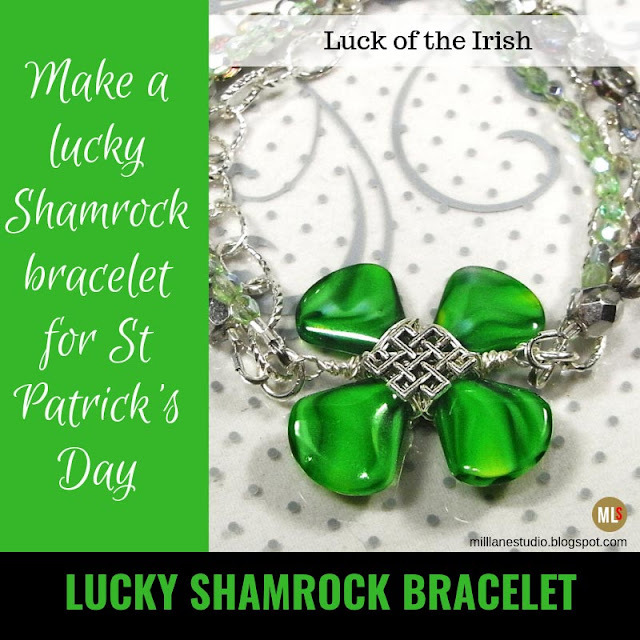 When it comes to luck, the Irish have it all down "Pat", if you'll excuse the pun: Pots of gold, lucky pennies and the most famous of all, lucky shamrocks. 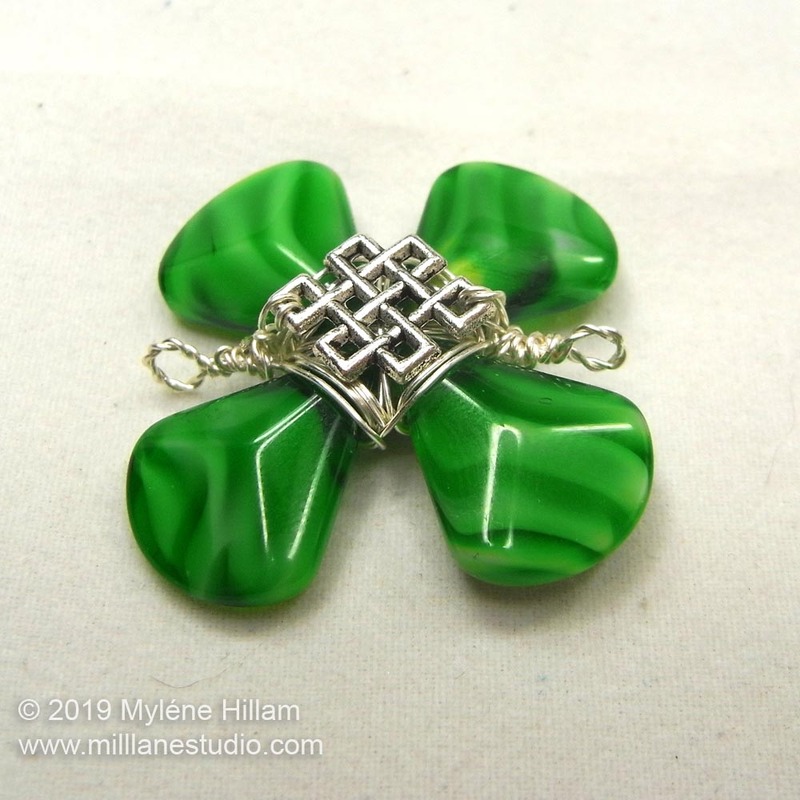 So what would St Patrick's Day be without a four leaf clover! 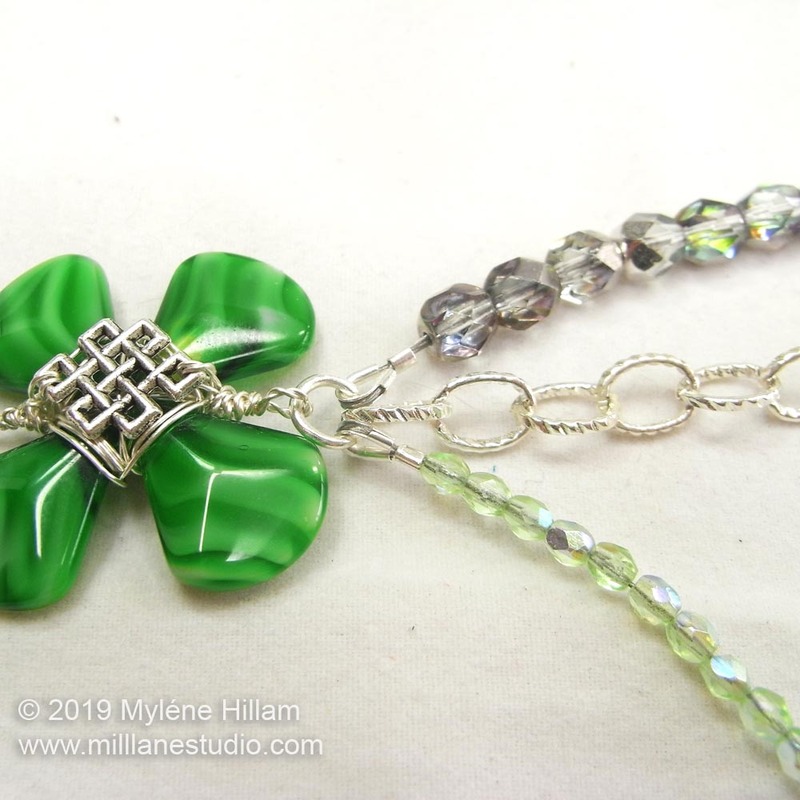 This Lucky Shamrock Bracelet is made using leaf beads strung together in a circle to create a clover shape. Cut a 24” length of wire. String the leaf beads and move them to the centre of the wire, form them in a circle and then thread one of the wires through a bead to secure them in a circle. Position the shamrock so the two wires are at the top. 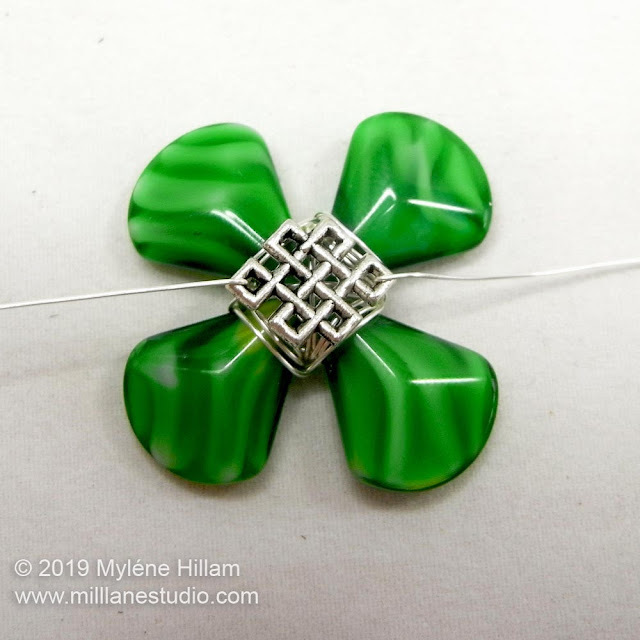 Take the wire on the right and cross it over the centre of the circle, wrap it around the back of the bottom bead, and back up across the front diagonally. Both wires will now be between the top and the left bead. Repeat with the second wire, crossing over the centre of the circle, around the back of the right hand leaf and back up across the front diagonally. This wire is now at the bottom on the left hand side. Continue wrapping the wires around the beads making sure that each bead is wrapped with wire at least twice on the front and twice on the back (some will be wrapped 3 or 4 times). Finish with the wires pointing up. Place one of the silver spacers over the both wires and position it on the front of the beads. Bend the wires around to the back and pull them firmly. Place the other spacer on the wires and bend the wires back towards the front. 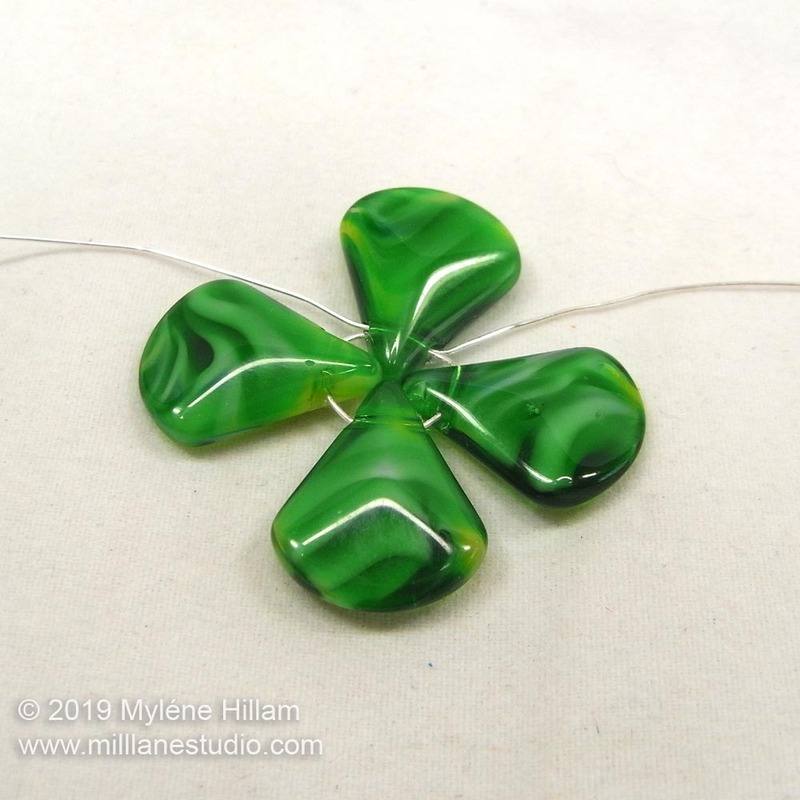 Cut an 8” length of wire and feed it through the back of the shamrock, between the beads and the spacer. You may have to wiggle it to get it through. 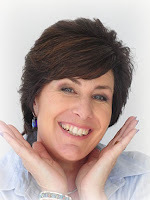 Pinch the two wires together near the beads and twist them until you have a tightly twisted wire. Repeat with the other end of the wire. 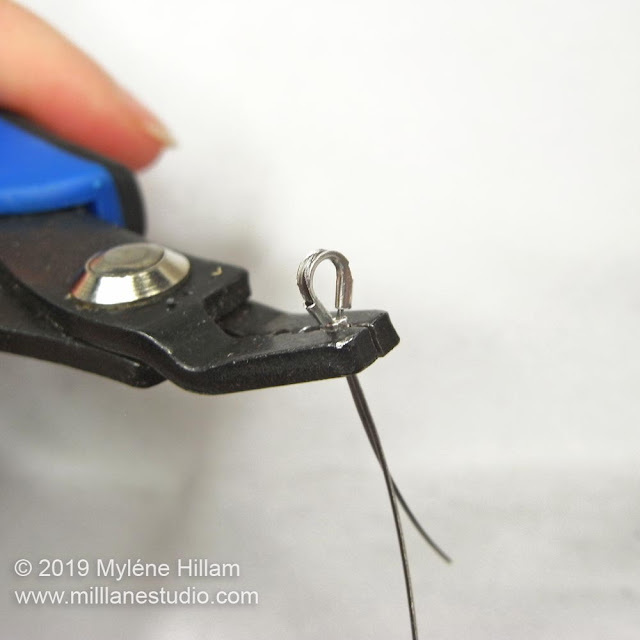 Create a wrapped loop at each end and trim away the excess twisted wire. You can see how to do that in this post. 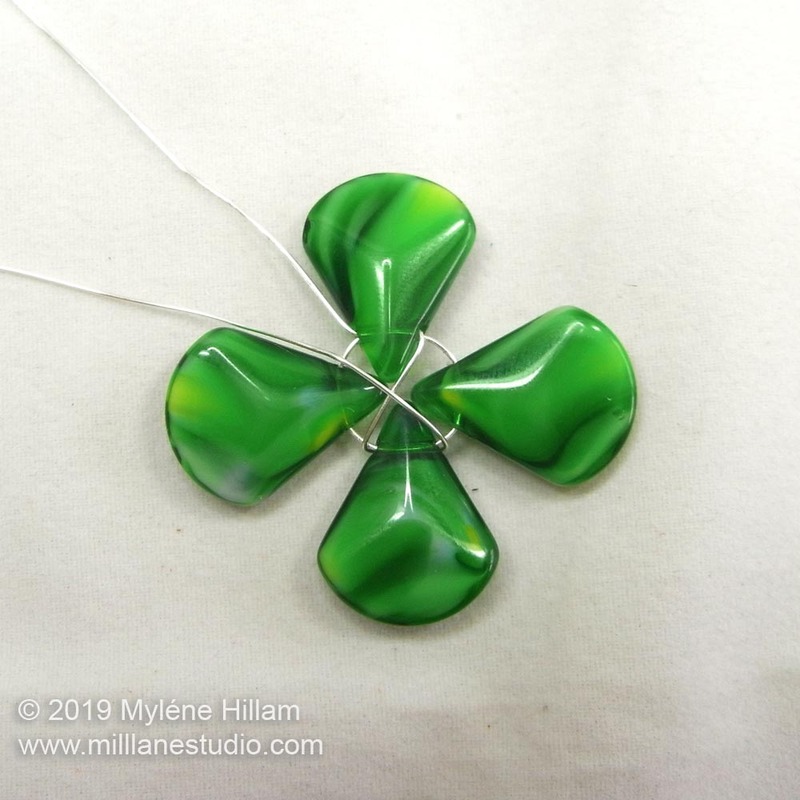 Make a wrapped loop on the other side of the clover leaf as well. Cut four 8” lengths of beading wire. On each wire, string a crimp and a wire guardian. Thread the beading wire back through the crimp and crimp in place. 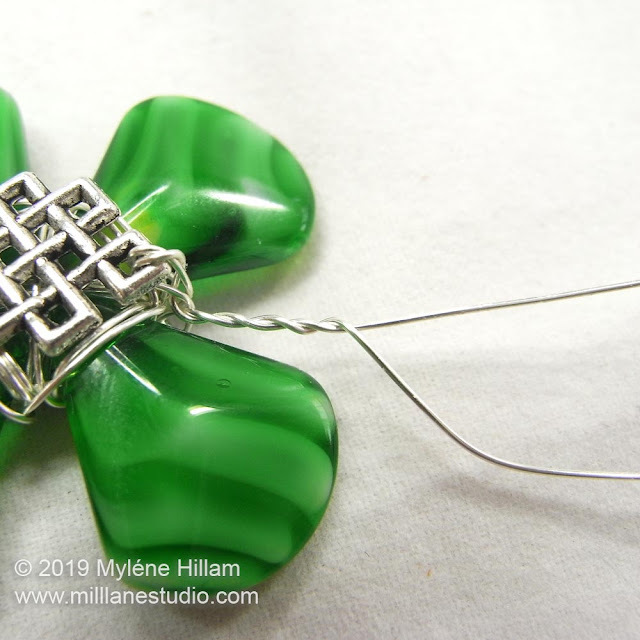 See this tutorial on how to crimp beading wire. String eighteen 3mm beads on one and ten 6mm beads on another, string a crimp tube and a wire guardian on each and crimp in place to secure. Repeat with the remaining beads. Cut the chain in half, open a jump ring and hook on the chain, a strand of 3mm beads and a strand of 6mm beads. 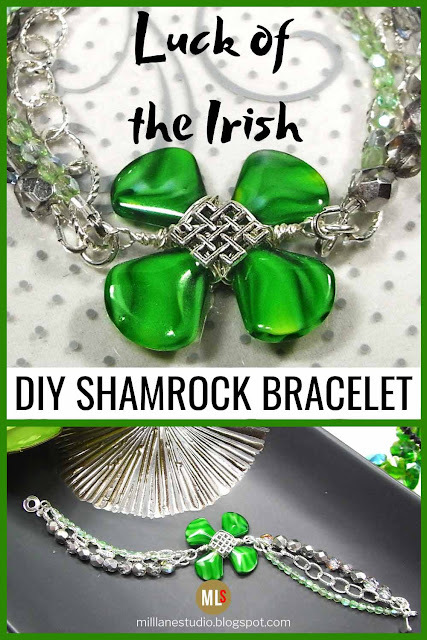 Attach it to the twisted loop of the shamrock and then close it. 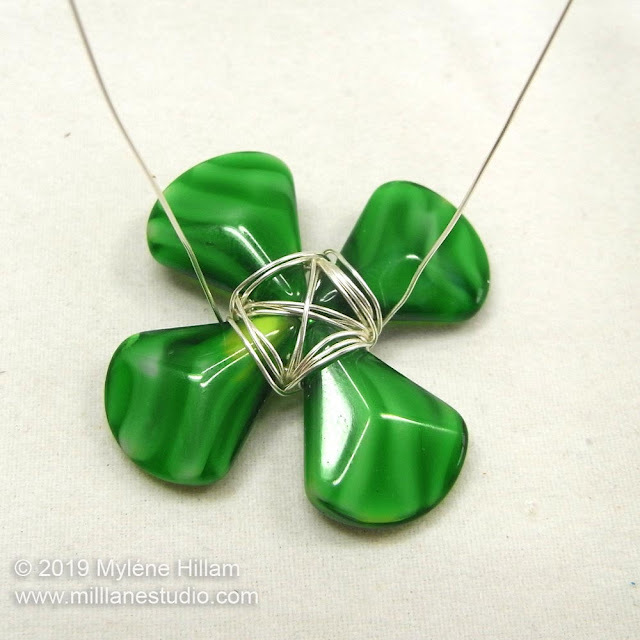 Repeat with the remaining strands on the other side of the shamrock. 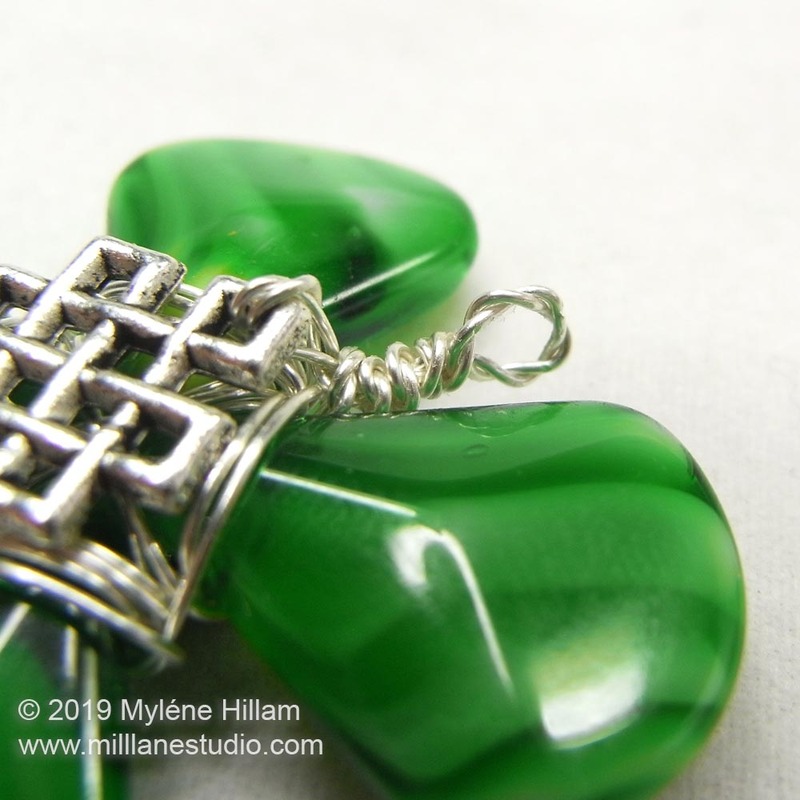 Open another jump ring and attach the loose ends of the chain and bead strands. 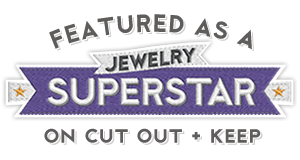 Before closing the jump ring, attach one end of the clasp. Repeat on the other side with the second half of the clasp. 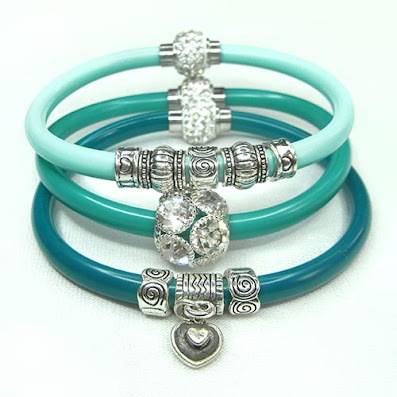 I absolutely love this bracelet! Can't wait to try it out! It gives the bracelet a bit more of a celtic feel too.